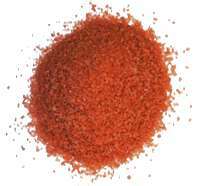 Red Alaea sea salt has been used by Hawaiians for centuries. The salt is used is cermonies to cleanse and purify tool and canoes used in rituals. It also has many medical benefits and conatins as many as 80 minerals. Hawaiians use the salt to stop bleeding and hemorrhagging from cuts, and is believed to reduce the chance of cancer. Red Alaea sea salt is also used in salt scrubs, exfoliates, scrubs, and masks, and is a popularly used product by many spas across the country.